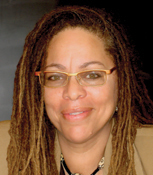 A graduate of Wellesley College and Northwestern School of Law, Professor Harris began her teaching career in 1990 at Chicago- Kent College of Law after working for one of Chicago’s leading criminal defense firms and later serving as a senior legal advisor in the City Attorney’s office as part of the reform administration of Mayor Harold Washington of Chicago. The interconnections between racial theory, civil rights practice, politics, and human rights have been important to her work. She was a key organizer of several major conferences that helped establish a dialogue between U.S. legal scholars and South African lawyers during the development of South Africa’s first democratic constitution. Since joining the UCLA Law faculty in 1998, Professor Harris has continued to produce groundbreaking scholarship in the field of Critical Race Theory, particularly engaging the issue of how racial frames shape our understanding and interpretation of significant events like Hurricane Katrina—(“Whitewashing Race”, in California Law Review), admissions policies (“The New Racial Preferences” in California Law Review)(with Carbado) and anti-discrimination law (“Reading Ricci: Whitening Discrimination, Race-ing Test Fairness” in UCLA Law Review) (with West-Faulcon). Professor Harris has served as a consultant to the MacArthur Foundation and has been on the board of leading academic societies, including the American Studies Association. She has served as faculty director for the Critical Race Studies Program at UCLA Law School and has been widely recognized as a groundbreaking teacher in the area of civil rights education, receiving the ACLU Foundation of Southern California’s Distinguished Professor Award for Civil Rights Education.